Vientiane Airport has doubled the size of its international terminal, supporting a Laotian initiative to boost tourism. Laos expects Vientiane’s international passenger traffic to double over the next five years, driven by a rapid increase in visitor numbers. Vientiane is being served by 15 foreign airlines this summer, whereas at the beginning of the summer 2016 season Vientiane was served by only seven foreign airlines. Vientiane currently has scheduled international services to 16 destinations. China accounts for eight, or half, of the destinations. Korea and Thailand are the other major markets; Vientiane is also linked with Cambodia, Malaysia, Singapore and Vietnam. Vientiane Airport‘s international terminal doubled to 2.3 million passengers per annum with the recent completion of an expansion project. Vientiane international passenger traffic declined in 2017 to less than 1 million but is expected to reach 1.5 million by 2023. China has been the fastest growing market, with Vientiane-China capacity increasing fivefold over the past six years. Thailand is still Vientiane’s largest market and also continues to experience some growth. Vientiane Wattay Airport opened an expanded international terminal in Aug-2018, boosting capacity to 2.3 million passenger per annum. The terminal, which currently handles around 150 departures per week, has doubled in size to 25,000 square metres. The expansion project cost nearly USD90 million and was primarily Japanese-funded – supported by the Japan International Cooperation Agency (JICA) with a Japanese ODA loan. The expanded terminal was built by the Japanese construction firm Hazama Ando. Japanese firms Jalux and Toyota Tsusho have operated the terminal at Vientiane for approximately 20 years through their JV company Lao–Japan Airport Terminal Services. The Laotian government recently extended their contract for another 10 years. The airport also has a smaller domestic terminal, which is projected to handle nearly 500,000 passengers by 2023. Laos expects international passenger traffic at Vientiane to reach 1.5 million by 2023. The newly expanded terminal should therefore provide sufficient capacity to support international growth for at least the next several years. The 1.5 million international projection seems ambitious, given that international passenger traffic at Vientiane was less than 1 million in 2017. Vientiane Airport has not released traffic figures since 2014, when it handled 690,000 international passengers and 300,000 domestic passengers. However, the Ministry of Tourism has provided figures through 2017 on the number of international visitors arriving at Vientiane Airport. In 2017 the visitor arrivals at Vientiane Wattay Airport decreased by 14% to 365,000. International passenger traffic likely decreased by a similar amount, given that a majority of traffic at Vientiane Wattay consists of inbound passengers (foreigners). Visitor arrivals at the airport had increased by 9% in 2016, to a record 422,000. The Laos Ministry of Tourism, Information and Culture reported declines from all 30 of its largest source markets in 2017, except China. Chinese visitor numbers to Laos increased by 17% in 2017, to 639,000. Chinese visitor numbers from Laos have more than quadrupled since 2011, when there were only 151,000 visitors. Source: CAPA – Centre for Aviation and Laos Tourism Development Department. There has been impressive growth in Chinese visitor numbers to Laos for six consecutive years – including growth of more than 20% in 2012, 2013, 2014 and 2015. However, the 17% increase for 2017 is particularly noteworthy because it came in a year when Laos’ tourism industry was otherwise struggling. Total visitor numbers to Laos declined by 9% in 2017, to 3.9 million, including a 10% decline in visitor numbers by air to 579,000. Laos expects tourism to recover in 2018, resulting in a resumption of visitor number growth. It expects total visitor numbers will reach nearly 7 million by 2025. Vientiane Airport is clearly banking on a resurgence in tourism to fill its newly expanded international terminal. While this year Laos has embarked on an initiative to promote tourism across all its main source markets, China will likely be the main driver of growth. Of the 639,000 Chinese visitors to Laos in 2017, 88,000 arrived by air, including nearly 75,000 at Vientiane Wattay Airport. 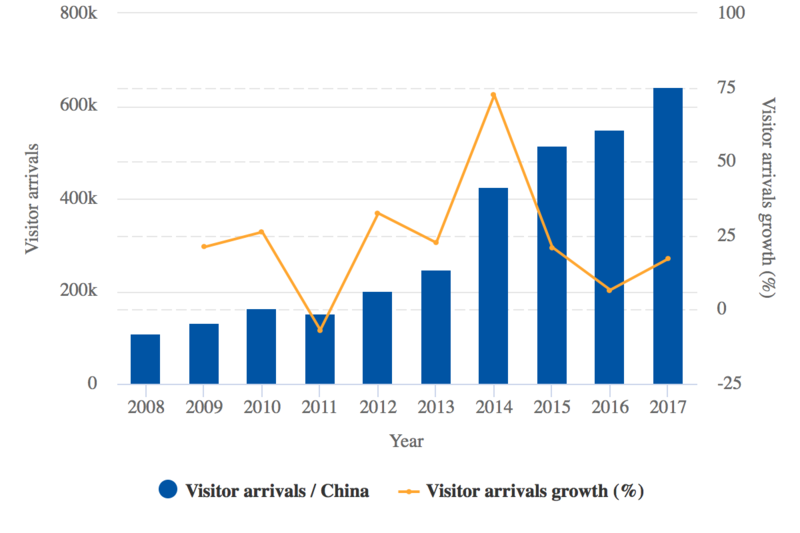 Most Chinese visitors to Laos now cross at the land border, but the number of services between China and Laos (particularly Vientiane) has grown rapidly in recent years. All the major population centres in China are located far from Laos, making air the only viable option as Chinese visitor numbers increase. There are currently nearly 7,000 weekly one-way seats from Vientiane to China. Capacity has doubled since Sep-2016 and has increased fivefold since Sep-2012, according to CAPA and OAG data. Source: CAPA – Centre for Aviation & OAG. China has been by far the fastest growing market for Vientiane over the past two years. China Eastern and Lao Airlines have added capacity in the Vientiane-China market, and three new airlines have entered the market. Of the eight airlines that have launched services to Vientiane since summer 2016, three are Chinese – China Southern, Hainan Airlines and Sichuan Airlines. Two years ago, Vientiane was served only by China Eastern. China Eastern currently operates 12 weekly services to Kunming, up from only five frequencies two years ago, and three weekly services to Nanning, up from two frequencies two years ago. Kunming is the most competitive of all of Vientiane’s China routes as it is also served by Lao Airlines and Sichuan Airlines, both of which currently have a daily service. Lao Airlines has served Kunming for several years, while Sichuan Airlines entered the market in summer 2017. Kunming is the capital of the southwestern Chinese province of Yunnan, which has close ties to Laos as it borders Laos and has an indigenous Lao population. For several years Kunming was the only Chinese destination from Vientiane. Guangzhou became the second Chinese destination for Vientiane in late 2012, when it was launched by Lao Airlines. Lao Airlines has since operated three weekly services on the Vientiane-Guangzhou route. China Southern has also operated three weekly services on the Vientiane-Guangzhou route since Sep-2017. Lao Airlines has accelerated expansion in China in the past three years, expanding its Chinese network from two to five cities. Lao Airlines launched Changsha and Changzhou in 2015, and Chengdu was added in Jun-2018. Chengdu is currently served with three weekly services, Changsha with two weekly services, and Changzhou with only one weekly service. Lao Airlines is the only airline operating nonstop services in all three markets. All of Lao Airlines’ China flights are now operated with A320s; it served Kunming with ATR 72s before taking delivery of its first A320 in 2011. Hainan Airlines is the only airline operating from Vientiane to Haikou and Shenzhen, and China Eastern is the only airline operating from Vientiane to Nanning. Hainan Airlines launched two weekly services from Haikou at the beginning of 2017 and added two weekly services from Shenzhen in late Oct-2017. Okay Airways could become the fifth Chinese airline in the Vientiane market as it has reportedly applied to the CAAC for approval to launch Tianjin-Vientiane service in Nov-2018. Tianjin would be the ninth Chinese destination from Vientiane, compared to only two four years ago. Although China accounts for half of Vientiane’s international destinations, Thailand is still a bigger overall market. Thailand currently accounts for approximately 31% of seat capacity at Vientiane, compared to 27% for China. Source: CAPA – Centre for Aviation and OAG. While there is significant local traffic between Laos and Thailand, a large share of Vientiane-Bangkok passengers flies beyond Bangkok. As Vientiane does not have any long haul flights, Bangkok is the main hub for passengers heading to Europe and the Middle East. The Vientiane-Bangkok route is served by Bangkok Airways, Lao Airlines, Thai AirAsia, Thai Airways and Thai Smile. Bangkok Airways and Thai Airways/Thai Smile, particularly, rely heavily on European connections. Bangkok Airways codeshares with several European and Gulf airlines, and Thai Airways has a large European network. Lao Airlines and Thai Airways enjoyed a duopoly on the Vientiane-Bangkok route until 2012, when it was opened up to allow multiple airlines from both sides. Bangkok Airways was able to launch one daily service to Vientiane in late 2012 and Thai AirAsia gained traffic rights more than three years later, launching one daily A320 flight in Jun-2016. For several years both airlines tried to secure approval from Lao authorities to serve Vientiane before their applications were finally approved. Bangkok Airways has also tried for a few years to secure Lao approval for a second daily service. The approval was finally secured earlier this year, enabling Bangkok Airways to add the second service with the beginning of the current summer schedule in late Mar-2018. Bangkok Airways serves Vientiane with a mix of A319s and A320s. Thai Airways transferred one of its two daily Vientiane services to Thai Smile in 2017. Thai Smile operates A320s, whereas Thai Airways uses A330s. Thai Airways served Vientiane with 737s until 2016 but is phasing the type out and transitioning to an all-widebody fleet. Lao Airlines has maintained two daily services on the Vientiane-Bangkok route for several years but adjusts capacity depending on the time of year by swapping between A320s and ATR 72s. Thai Airways is the largest foreign airline group in the Vientiane market, accounting for approximately 12% of international seat capacity (includes Thai Smile). 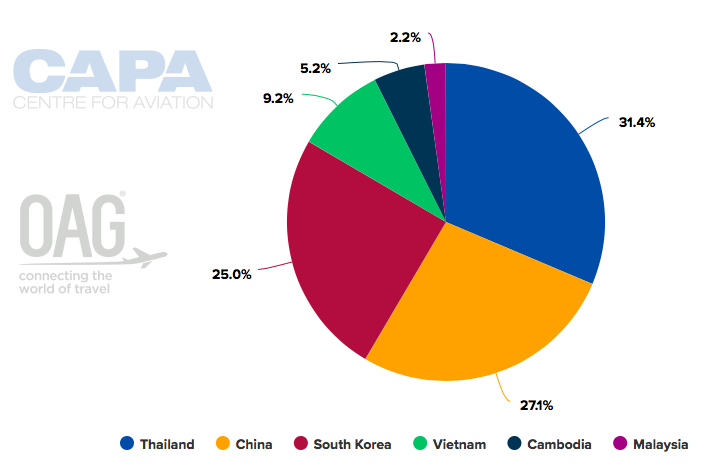 Vietnam Airlines and China Eastern are the second and third largest foreign airlines, each accounting for close to a 10% share. Bangkok Airways is the fourth largest with a nearly 8% share. 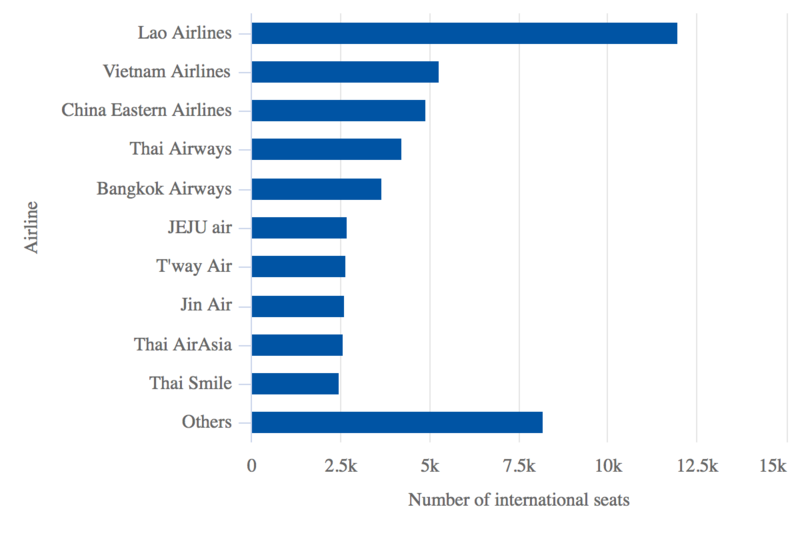 Lao Airlines is the market leader and accounts for 23% of international seat capacity at Vientiane. The flag carrier links Vientiane with the four main markets of China, Thailand, South Korea and Vietnam. Lao Airlines has been considering a new service from Vientiane to Tokyo, which would be the airport’s first nonstop link to Japan. South Korea is the third international market from Vientiane, accounting for 25% of international seat capacity. Vietnam is much smaller, with a 9% share. The only other two markets served from Vientiane – Cambodia and Malaysia – account for only 5% and 2% of total international seat capacity respectively. Vietnam Airlines is the only airline with services from Vientiane to Phnom Penh in Cambodia, operating a daily A321 frequency. In addition, Vietnam Airlines operates a daily A321 flight from Vientiane to Hanoi but does not connect Vientiane with Ho Chi Minh. Lao Airlines also has a daily service on the Vientiane-Hanoi route, using A320s. Vientiane-Seoul is a highly competitive route with daily services from three Korean LCCs – Jeju Air, Jin Air and T’way. Lao Airlines serves the route with five weekly services in its summer schedule and seven weekly services in its winter schedule. Seoul is the second largest international route from Vientiane after Bangkok. South Korea is Laos’ fourth largest source market after Thailand, Vietnam and China. 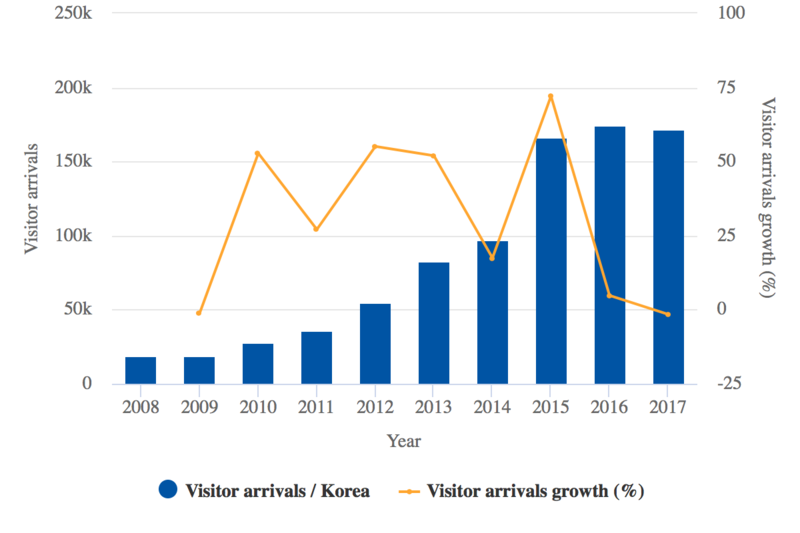 South Korean visitor numbers to Laos increased tenfold from 2009 to 2016, but declined by 2% in 2017. There were slightly more than 170,000 South Korean visitors to Laos in 2017, accounting for 4% of the total. While South Korea accounted for only 4% of total visitor numbers to Laos in 2017, it accounted for a more significant 28% share of visitors by air. There were 133,000 South Korean visitor arrivals at Vientiane Airport in 2017, compared to 35,000 Thai visitor arrivals and only 16,000 Vietnamese visitor arrivals. While Thailand and Vietnam are much larger source markets overall, most visitors cross by land. There are eight land crossings from Laos to Thailand and eight crossings from Laos to Vietnam. Vientiane is located very close to the Thailand border and is less than 100km from the Thai city of Udon Thani. Total Thai visitor number to Laos declined by 11% in 2017, to 1.8 million, and Vietnamese visitors to Laos also declined by 11%, to 900,000. While the decline in Thai and Vietnamese numbers reflects the decline in land border crossings, other source markets that mainly rely on air links also dropped in numbers in 2017. For example, visitor numbers from Europe declined by 27%, to 222,000. Visitor numbers from the Americas declined by 34%, to 64,000, and visitor numbers from Australia dropped 37%, to 21,000. Australia, France, Germany, the UK and US are all in the top 10 source markets for Laos’ tourism industry. Arrival by air accounted for only 13% of total visitors to Laos in 2017. Vientiane Wattay Airport accounted for 9% and Luang Prabang Airport accounted for another 3%. Visitor arrivals at Luang Prabang dropped by 1% in 2017, to 130,000, but had increased by 35% in the 2013 to 2016 period. Laos’ other two international airports, at Pakse and Savannakhet, are very small, and do not have any foreign airline services. Lao Airlines currently serves Pakse from Bangkok and Ho Chi Minh (less than daily using ATR 72s). Lao Airlines suspended services on the Savannakhet-Bangkok route in Oct-2017 and currently only has domestic services, despite the airport’s international designation. Note: Grand total is total visitor numbers, including air and land. Source: Laos Tourism Development Department. Luang Prabang has grown in recent years, benefitting from a runway extension that was completed in 2012 (accommodating narrowbody jets) and a new international terminal, which opened in 2013. A new more liberal policy was also introduced in 2016, enabling foreign LCCs to enter the Luang Prabang market for the first time in 2016. However, Luang Prabang Airport is still very small and capacity constrained. Laos is focusing mainly on growing international traffic at Vientiane while trying to preserve Luang Prabang, a UNESCO heritage site, as a boutique high-end destination. Luang Prabang currently has five routes to China but only 1,400 one-way weekly seats to China, compared to the nearly 7,000 seats from Vientiane. Overall, Luang Prabang currently has less than 14,000 international seats, compared to more than 50,000 at Vientiane. Luang Prabang is more seasonal, with international seat capacity increasing to 20,000 seats weekly in winter, but even in its peak season its capacity is still much smaller than Vientiane’s. While Luang Prabang is a popular destination with growth potential, Vientiane will likely experience faster growth over the next several years as it has the infrastructure in place and is the government’s preferred gateway. Laos has invested significantly in upgrading Vientiane Airport and is now hoping it can successfully boost visitor numbers to fill the expanded international terminal. ← Can Tourism Boost Lao’s Economy?